Actor John Malkovich never played a vampire in the dozens of movies he has appeared in. He did appear in a horror film called Shadow of the Vampire but his character wasn't a vampire. It is a shame because the man is a massively-talented actor and his weirdness would've translated very well into the big screen if he ever played a blood-drinker. 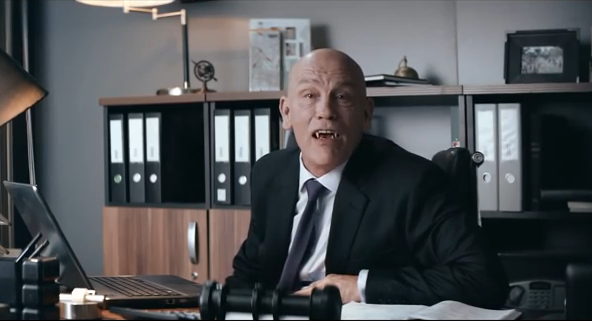 The French video service company Canal Play may have seen this missing aspect of Malkovich's resume that they came up with a commercial wherein the actor played a vampire. And it's awesome. Portraying a vampire banker who spends most of his time watching movies, Malkovich suits the character very well. Here's to hoping that some movie executive sees the commercial and gets inspired to come up with a feature film starring Malkovich as a vampire. Because those fangs look perfectly on him. Malkovich is currently playing the feared pirate Blackbeard on the NBC television series Crossbones. Malkovich is one of the most talented actors of his generation. He has appeared in memorable films like The Killing Fields, Death of a Salesman, Empire of the Sun, Dangerous Liaisons, Of Mice and Men, In the Line of Fire, Con Air, Being John Malkovich, Adaptation, The Hitchiker's Guide to the Galaxy, and Burn After Reading.